A Stranger Earth: The Ropen: Another Prehistoric Survivor? 2010: Year Of Posts About Prehistoric Survivors? Maybe (see Dinosaurs Are Alive for more). I must say, before we start today's post on the Ropen (a possible pterosaur seen in Papua New Guinea), that many of the sightings and witness reports have been made or taken by creationists. Just fair warning! 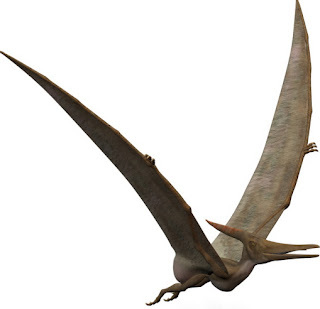 Oh, and also, I must do my usual public service announcement: pterosaurs are not dinosaurs. With that out the way... let us begin. The Ropen is a flying creature reported from Papua New Guinea, specifically Umboi Island. Described as having a large wingspan, a large protuberance from the back of it's head and a long tail which is also supposed to glow. These features (except maybe the glowing tail!) lead many to believe the Ropen to be some sort of pterosaur. Duane Hodgkinson, now a flight instructor in Livingston, Montana, in 1944 was stationed near Finschhafen, in what was then called New Guinea. After he and his buddy walked into a clearing, they were amazed as a large creature flew up into the air. The men soon realized that it was no bird that started to circle the clearing. It had a tail “at least ten to fifteen feet long,” (book Searching for Ropens, 2007) and a long appendage at the back of its head: apparently, a live pterosaur. Ropens also has plenty of local's own eyewitness accounts and also some "objective" study of these reports can be found here. There are some videos out there such as this tourists film, some interviews and info films here and an elusive video by Paul Nation which featured a series 3 episode of MonsterQuest. That video shows two lights in the night sky, which I think look artificial but others have different opinions. Is there really any chance of there being undiscovered creatures in Papua New Guinea. Erm... quite a big chance actually. Papua New Guinea still has uncontacted people, and is one of the places where new zoological (and botanical) discoveries are occurring at an awe inspiring rate. If there is any chance of something that's very large and land or air based being discovered, then one of the most probable places for it to be found is in eastern Indonesia and Papua New Guinea. I don't get the feeling that people are making these stories up. That doesn't mean I believe that the ropen is a real, undiscovered species of animal. My main problem is the way it is being used to further a Christian/creationist agenda, especially considering there is nothing for them to gain by discovering a live pterosaur descendant in proving the existence of God or intelligent design. Check out some of sources out there about this, there is plenty of interesting material. 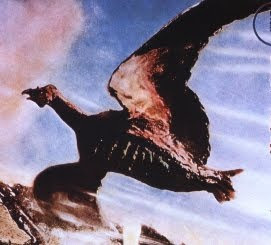 But try not to confuse the Ropen with Rodan.